Leipzig. Environmental contaminants, such as smoking, are harmful to the human organism in relation to the occurrence of allergies. This is known. Until now, researchers had never investigated whether and to what extent environmental contaminants also affect allergy-relevant stem cells. For the first time a team at the Helmholtz Centre for Environmental Research (UFZ) has found evidence for this: Smoking affects the development of peripheral allergy-relevant stem cells in the blood. In order to present this result Dr. Irina Lehmann and Dr. Kristin Weiße chose a new scientific path: The combination of exposure analysis and stem cell research. With the help of passive samplers it is examined in the LiNA-cohort study that environmental contaminants such as volatile organic compounds (VOCs) have an impact on human health. CC BY 3.0 (http://creativecommons.org/licenses/by/3.0/)	Stem cells are not specialised, propagate without limit and can develop to different cell types. From these the different cell and tissue types of the human organism, including the allergy-promoting eosinophil granulocytes, are differentiated. 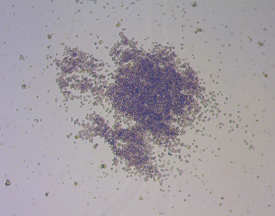 Progenitor cells, e.g. eosinophil/basophilic progenitors, which mature in the bone marrow and are then washed out into the bloodstream – the so-called periphery - function as a link between unspecialised stem cells and specialised tissue and organ cells. Until now, whether and to what extent environmental contaminants affect this maturation and release has not been investigated. The UFZ team of Dr. Irina Lehmann and Dr. Kristin Weiße undertook their investigations from this point. Two facts were already known from a number of earlier studies: Firstly that the blood of allergy sufferers – whether children or adults – shows evidence of increased eosinophil/basophil progenitor levels. Secondly, that the occurrence of such peripheral progenitors in the blood of the umbilical cord indicates a higher risk for subsequent allergies. For the first time, the hypothesis which Dr. Kristin Weiße and Dr. Irina Lehmann developed on this basis combined this knowledge from stem cell research with the results of many years of exposure research at the UFZ. The researchers characterise their approach in the following way: "We wanted to clarify the relationship between environmental influences and the maturation and differentiation of the progenitor cells on the one hand and its contribution to the occurrence of allergies on the other hand. Specifically, we wanted to know whether the occurrence of allergy-relevant progenitor cells in the blood of infants can be changed by environmental influences". The results of the study, based on the data collected from 60 children aged one year, were recently published in the British medical journal "Clinical & Experimental Allergy“: It was found that children with skin manifestations, such as atopic dermatitis or cradle cap, have increased levels of eosinophil progenitors in their blood. In this connection, it was shown for the first time that children already afflicted show particularly sensitive reactions when exposed to environmental contaminants: The offspring of families exposed to significant levels of volatile organic compounds (VOC) at home were found to have considerably higher allergy-relevant eosinophilic/basophilic progenitor cell levels. "That VOCs, large amounts of which are released with cigarette smoke, have the greatest effect on stem cells was not entirely unexpected", explains Dr. Irina Lehmann. "Just as important, however", adds Dr. Kristin Weiße, is "that we can show that alterations in the number of stem cells as a result of harmful substances take place only in children who have already been afflicted with skin manifestations." This leads to the conclusion: There is a relationship between the genetic predisposition for a disease and environmental influences – there are environmental and life style factors which determine whether a genetic predisposition is in fact realised or not. Stem cells are not specialised, propagate without limit and can develop to different cell types. From these the different cell and tissue types of the human organism, including the allergy-promoting eosinophil granulocytes, are differentiated. 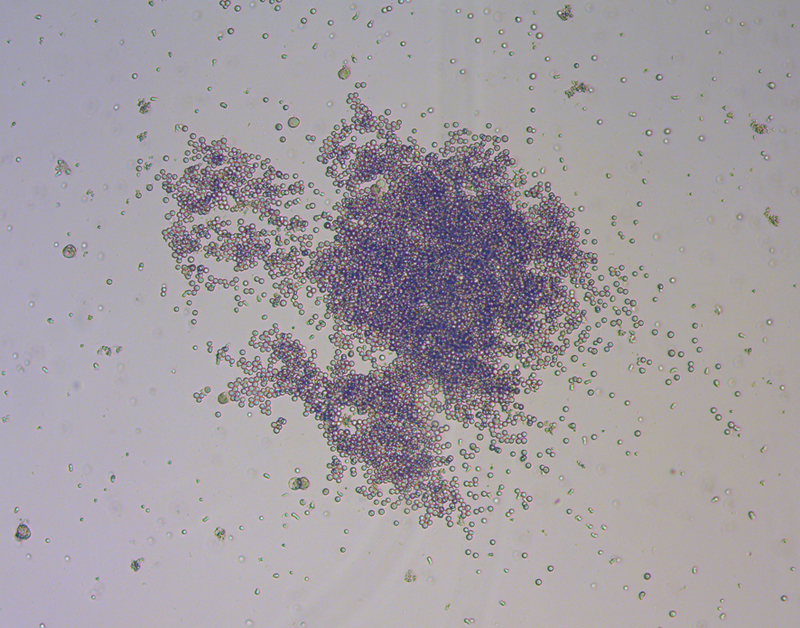 Progenitor cells, e.g. eosinophil/basophilic progenitors shown in the picture, which mature in the bone marrow and are then washed out into the bloodstream – the so-called periphery - function as a link between unspecialised stem cells and specialised tissue and organ cells. CC BY 3.0 (http://creativecommons.org/licenses/by/3.0/)	Considerable logistical effort underlies this knowledge: On the one hand there is the long-term study "LiNA – Life Style and Environmental Factors and their Influence on The Risk of Allergy” in Newborn Children, a joint project of the Helmholtz Centre for Environmental Research and the Städtisches Klinikum St. Georg in Leipzig. 622 mothers, with a total of 629 children born, were recruited for the study between 2006 and 2008. In order to also take prenatal environmental influences into account - in contrast with earlier comparable studies of newborn children – mothers were already included in the investigations during pregnancy and the children from the time of birth. At the same time, it was necessary to become familiar with the methods required for stem cell analysis at the laboratory of the Canadian cooperation partner, Professor Judah Denburg of the McMaster University in Hamilton and to transfer this knowledge to Germany. Dr. Kristin Weiße spent six months in Canada working in the group of Professor Denburg in order to acquire the necessary know-how and profit from the experience of the Canadian partners. Dr. Lehmann and Dr. Weiße agree that "with the subject of environmental contamination and stem cells we have established an exciting new field of research". The UFZ team is currently the only one in the world investigating this relationship with analytical precision and methodical patience. The LiNA study, in the course of which mothers and their children can be observed over several years, represents a unique basis. This research project was supported by the German Academic Exchange Service (DAAD) and the AllerGen NCE Inc. network. The Helmholtz Association contributes towards solving major and pressing social, scientific and economic issues with scientific excellence in six research areas: Energy, Earth and Environment, Health, Key Technologies, Structure of Matter, Aeronautics, Aerospace and Transport. The Helmholtz Association is Germany’s largest scientific organisation with over 33,000 employees in 18 research centres and an annual budget of approximately 3.4 billion euros. Its work stands in the tradition of the naturalist Hermann von Helmholtz (1821-1894).